In nature, several animals have evolved design solutions that enable them to successfully transition between water and air, and move in both media. Examples include flying fish, flying squid, diving birds and diving insects. We have reviewed the biological literature on these multimodal animals and abstracted their underlying design principles with the aim of building a robotic equivalent, the Aquatic Micro Air Vehicle (AquaMAV). Our exploration has identified key adaptations from nature and designs from robotics. Based on this evaluation we have proposed key design principles for the design of successful aerial-aquatic robots, i.e. using a plunge diving strategy for water entry, folding wings for diving efficiency, water jet propulsion for water takeoff and hydrophobic surfaces for water shedding and dry flight.Current Micro Aerial Vehicles (MAVs) are greatly limited by being able to operate in air only. Designing multimodal MAVs that can fly effectively, dive into the water and retake flight would enable applications of distributed water quality monitoring, search and rescue operations and underwater exploration. While some aircraft can land on water, no technologies are available that allow them to both dive and fly, due to the dramatic design trade-offs that have to be solved for movement in both air and water, and due to the absence of high-power propulsion systems that would allow a transition from water to air. Aerial robots capable of locomotion in both air and water would enable novel mission profiles in complex environments, such as water sampling after floods or underwater structural inspections. A significant challenge for aquatic take off is that miniature flying vehicles generally do not have sufficient power for transition to flight from water. To address this, we have developed a novel jet propelled robot able to perform jumpgliding leaps from water, and a planar trajectory model that is able to accurately predict aquatic escape trajectories. Using this model, we are able to offer insights into the stability of aquatic take-off to perturbations from surface waves, and demonstrate that an impulsive leap is a robust method of flight transition. The AquaMAV uses a CO2 powered water jet to escape the water, actuated by a custom shape memory alloy gas release. The robot can leap from beneath the surface, where it can deploy wings take flight, and can reach speeds above 11 m/s in under 1 second. The design of such a vehicle is challenging because it implies significant propulsive and structural design trade-offs for operation in both fluids. The most recent AquaMAV prototype is a 200 gram fixed wing aircraft, which uses a reconfigurable wing to dive into the water from flight, inspired by the plunge diving strategy of water diving birds in the family Sulidae. 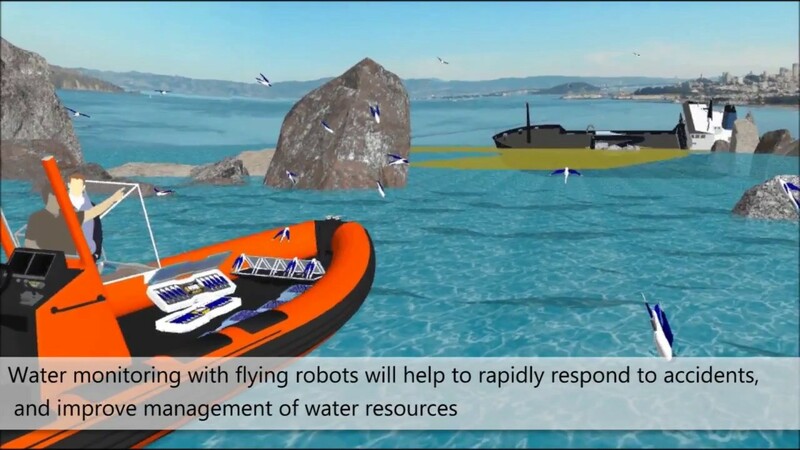 The AquaMAV has sufficient battery capacity for 14 minutes of flight in air at 10m/s, which corresponds to a 5km range at which the robot can dive into water and return to base with a collected water sample. The vehicle's performance has been investigated in wind and water tunnel experiments, from which we have developed planar trajectory models, which have been used to predict the dive behaviour of the AquaMAV, and investigate the efficacy of passive dives initiated by wing folding as a means of water entry. The robot is constructed from carbon fibre and kevlar composites, and is able to sustain the impact forces of dives into water at flight speed. Current research efforts are exploring adaptations to the robot which will allow it to reduce the drag during a dive, and increase the AquaMAV’s maximum dive depth by exploiting the interaction between air and water as it passes through the surface. We have developed a hybrid Aquatic Micro Aerial Vehicle (AquaMAV) that dives like a gannet and launches like a flying fish, to collect water samples. It was published in the December 2016 issue of Royal Society Interface Focus. Royal Society Interface Focus, December 2016. IEEE/ASME Transactions on Mechatronics, pp. 1-12, October, 2016‌. IEEE Intl. Conference on Robotics and Automation (ICRA), May 2015. Bioinspiration and Biomimetics, vol. 10, no. 2, pp. 1-12, 2015. Bioinspiration and Biomimetics, vol. 9, no. 3, pp. 1-15, 2014. The ability to move between air and water with miniature robots would allow distributed water sampling and monitoring of a variety of unstructured marine environments, such as coral reefs and coastal areas. To enable such applications, we are developing a new class of aerial-aquatic robots, called Aquatic Micro Aerial Vehicles (AquaMAVs), capable of diving into the water and returning to flight. One of the main challenges in the development of an AquaMAV is the provision of sufficient power density for take-off from the water. We are currently developing novel novel systems for powerful, repeatable aquatic escape using contained gas explosions. Our first demonstrated prototype is a 34 gram water jet thruster, which expels water collected from its environment as propellant. The device overcomes the miniaturisation problems of combustible fuel control and storage by generating acetylene gas from solid calcium carbide, which is reacted with environmental water. The produced gas is then combusted in air in a valveless combustion chamber to produce over 20N of thrust, sufficient to propel small robots into the air from water. The system for producing combustible gases from solid fuels is a very compact means of gas storage, and can be applied to other forms of pneumatic actuation and inflatable structure deployment.